Digital voices help individuals live more independently through easy access to technology. Acapela aims to provide everyone, whatever their disability or impairment, with a personalized digital voice, to help them live more independently through easy access to technology. Acapela has been present for decades in the Accessibility market. We have established strong relationships with the community and our voices ease the daily lives of thousands of users around the world. Our expertise, the ongoing breakthrough innovations in the voice area and our capacity to create voices for everyone in new ways mean we are in an optimal position to open new paths for all end users, from kids to seniors. 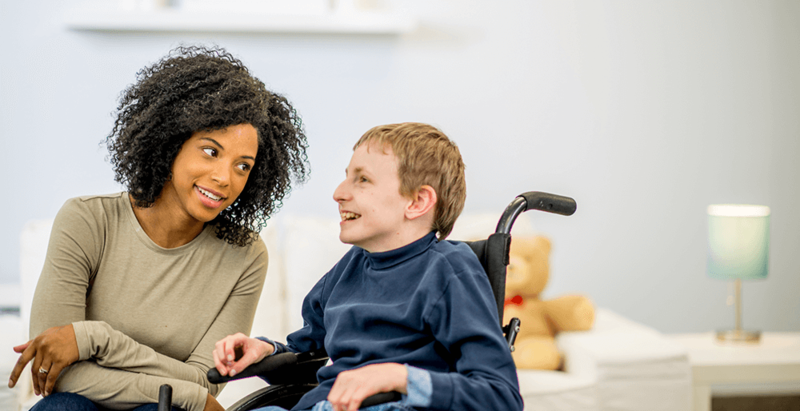 For children and adults who are unable or reluctant to speak, AAC (Augmentative and Alternative Communication) solutions encourage social interaction and provide greater independence. Acapela gives people a voice, enables everyone to be heard. AAC includes all forms of communication that are used to express thoughts, needs, wants, and ideas. People with severe speech or language problems rely on AAC to increase social interaction, school performance and feelings of self-worth. The solutions using voice technology range from simple buttons or pages that speak when touched, to very sophisticated systems. Special augmentative aids (also known as Assistive Technologies or AT), such as picture and symbol communication boards and electronic devices, are available to help people express themselves. Solutions may be based on familiar equipment such as mobile devices, tablets and laptops, others use equipment specially designed to support communication. Acapela Group provides the voice for AAC solutions, lets them talk, giving AAC specialists the perfect tool, online and offline, for working on a wide range of operating systems. We provide a voice for children with speech or language disorders through a unique children’s voice portfolio, which we are expanding. For individuals diagnosed with speech or language disorders – resulting from ALS (Amyotrophic Lateral Sclerosis) or other conditions such as aphasia, dysarthria or apraxia – we can recreate a synthetic version of their voice, to preserve this crucial part of their identity. Voice solutions provide visually impaired and blind users with an essential access to content and help them perform everyday tasks. Innovations have removed barriers to daily life, education and employment and each day new solutions are contributing to make the world more accessible. Acapela voices have been helping users for decades. Using voice solutions, blind and visually impaired users can access any content, browse the Internet, access their computer, navigate autonomously, walk through streets using a GPS, read the latest books or newspapers, watch the TV, consult a menu in a restaurant, easily access public places, enjoy a museum, play games, recognize objects, use public transport and so much more. Students with visual impairments can complete homework, do research, and read books along with their sighted classmates, thanks to advances in technology. Acapela Group provides the voice to solutions designed for the blind and visually impaired, enabling them to access the information they need. Acapela’s wide range of voices can read at high speed or keep to a more natural pace, depending on the user’s preference. The portfolio includes over 120 voices in 30 languages, there’s a voice for everyone: emotive voices, children’s voices, voices adapted to read long texts. Our solutions work on a wide range of operating systems, online and offline. For companies or organizations wanting to use their own exclusive voice, we can create custom voices. With global ageing comes a global demand for specialized products and services. Today’s tech-savvy older adults require new services and tools, employing appropriate communication styles and voice solutions. Baby boomers are hitting retirement with a vitality and vigour that’s redefining how silver citizens are living and enjoying their life and the way healthcare is administered. Voice solutions will play an important role by providing advanced yet easy talking interfaces, they will help to access content, assist medical automation processes, enable health applications and medical devices to talk, help in transport, provide audio reading, speech enable wearables and alerts, give a voice to robots for personal life assistance, home equipment, IoT (Internet of Things) and much more. Speech solutions are an essential part of Senior Care technology, they help maintain routines and lifestyle and keep people safe and independent. Acapela Group provides the voice to solutions designed for the elderly, ensuring they have easy access to specific advanced services and information. The portfolio includes over 120 voices in over 30 languages, there’s a voice for everyone: emotive voices, voices with accents, voices adapted to read long texts. For individuals preferring to use a personalized voice, they can do so by creating their own personalized voice using our voice banking program. For companies or organizations wanting to use their own exclusive voice, we can create their own exclusive custom voices. Over 30 languages and over 120 voices in the standard portfolio, expressive and emotive voices or custom voices. Over 20 children’s voices are available. Check out our natural-sounding children’s voices, they meet the needs of young users looking for a voice that reflects their age. Our voice solutions are available on different platforms. For Windows, Windows Universal Platform (UWP), Mac OSX, iOS, Android, Linux: check out our SDKs. Offline and online solutions. We can create a custom voice for the exclusive use of a company or a brand. Your own exclusive voice will enhance your brand’s identity and differentiate your services. Dedicated to individuals diagnosed with speech or language disorders, my-own-voice offers end users the possibility to keep speaking and communicating using their very own voice. Voice creation based on ‘Deep Learning’ by the Acapela Research Lab. Acapela Deep Neural Network creates a synthetic version of any voice based on a few minutes of speech recordings. All-in-one local and portable talking companion for visually impaired users. Acapela TTS Voices for NVDA adds high-quality and high performing voices to your NVDA screen reader. Video made by John Costello, Director of Boston Children’s Hospital’s Augmentative Communication Program, using and commenting on his own voice created with my-own-voice.